If you are a regular visitor to bloomingpoppies, you may have had just about enough posts about this quilt. So sorry, but I’m really bummed out today and need to vent and possibly get a bit of advice…… so please bear with me! My Bernina and I are having a bit of trouble getting along right now. I’m sure many of you have been there as well, right? I love my machine, but I finally had to throw in the towel, turn off the machine, and call for our local sewing machine magician of sorts who makes house calls. So here’s the story…. 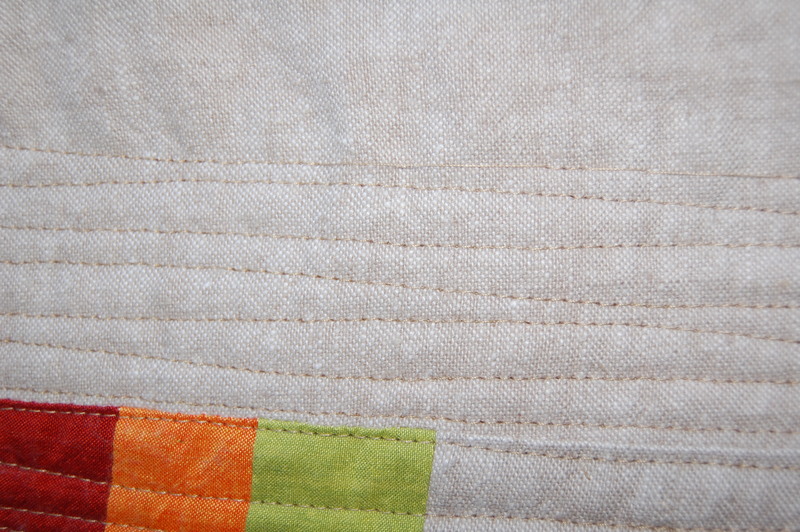 All was going along just fine and I was enjoying finding a nice rhythm with my quilting lines on this quilt, when all of a sudden, my bobbin thread just broke!!! HHmmm? okay, so I took it out checked it, reloaded it and got back to quilting. After many stitches, it broke again. Again I fiddled and reloaded. The third time, I started getting really irritated. I unwound the small amount of remaining thread, and loaded a brand new bobbin. At that point, I believe I also changed my needle, and rethreaded my top thread as well. Thinking the problem must surely be solved, I began quilting again. 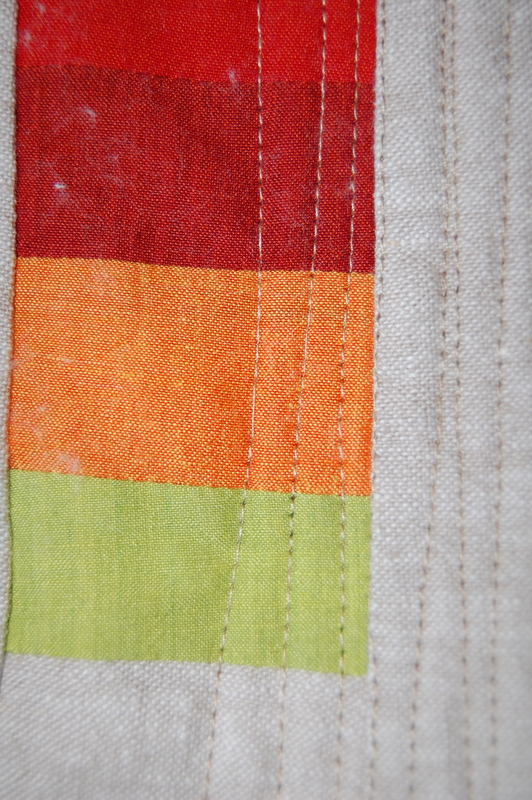 Then I began noticing some skipped stitches*** huge gasp*** and my heart sinks!!! Not sure if you can tell in this photo (on the orange), but they are there and there are a lot more ……. at this point I began to get extra irritated, luckily I was home alone and could properly express that irritation– if you know what I mean!! Anyway, this battle with my machine continued on and off for hours. It would move along okay for a while and I could get a line or two done, but then it would get all crazy again and I’d have to rip out a bunch of stitches. I oiled it, changed my needle again, rethreaded, etc. Finally, after doing this ridiculous ritual for way too long, I noticed this extra long…. um can you even call it a skipped stitch? Just a huge section completely un sewn, and then stitches following it?????? What the…….??? (You’ll notice it in the top line of the above photo, that is the top and the last line ) *deep sigh* I turned off the power to admit defeat…… for now. I did however, have to go in and just check my bobbin one last time, and I have a strong suspicion that is the culprit. The tension feels off or something but I don’t know how to fix it. EEEeek!! I guess I need to start learning these things. Sewing machine fix-it man, please get here soon, I’ll take lots of notes!!! By the way, in case you are all wondering why this is stressing me out this much, I’ll tell you now, this quilt is one that I’m hoping to enter into the Modern Quilt Guild Showcase for Quilt Market this Fall– there I said it!! But the deadline is next Friday! I do not have time for this. 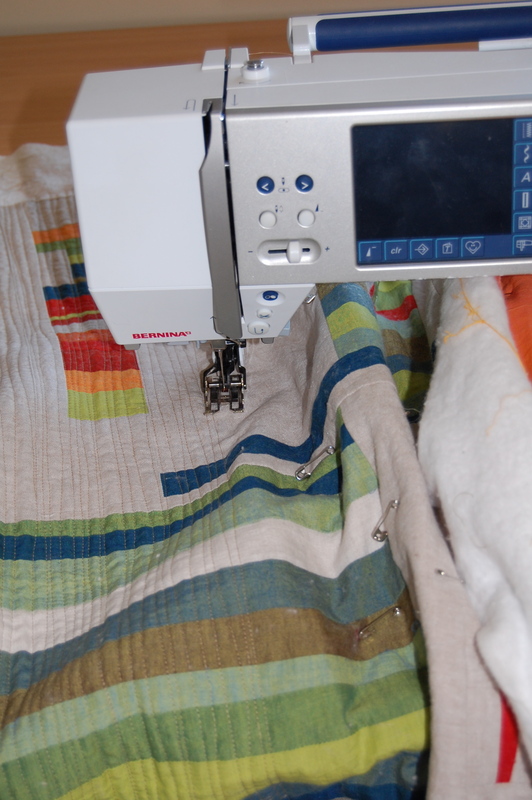 Bernina, I love you, please pull through for me, and all you kind readers and quilters out there, please feel free to send along some good “quilty love” toward my little, hard working (likely overworked) machine!!! Okay, that is the end of my rant!! Thanks for hearing me out, I’ll keep you posted on the outcome! I wonder if cleaning your machine would help? I think I’ve heard that lint build-up can cause problems like that. Good luck-it’s going to be a beautiful quilt! YES, I forgot to mention that in the post! I actually did clean it really well, there was a ton of lint, and other fuzzy “crud” in there. My repair man will be very proud of me-:-). Unfortunately that didn’t seem to be the problem!! Thanks! Ugh there is nothing so frustrating!! I hope it’s fixed ASAP and if not is there a machine you could borrow or rent? I know you can get it done in time! I think your quilt is just lovely and was looking forward with you to see it completed. I hope you get your Bernie fixed. Mine did that last spring and it actually took two trips to the repair shop. It hums like new and my technician said I had gotten my money’s worth out of that machine. I thought later, “Funny man! I’m not dead yet! This machine was supposed to last through my retirement, but little did I know when I bought it how much I’d be putting it through its paces. I had this problem recently and have started quilting another quilt with no problems…I’m chalking it up to a bad spool of thread, but even though I bought a new spool, I haven’t brought myself to try again on the quilt in question. Did you try checking the pressure of your pressure foot? Be sure it is all the way down. so sorry!!! i have NO idea. i’m just hoping you can get a fix or borrow another machine!! I had different problems with my new machine…. Lots of strong words were spken… I have reset it to the ” factory settings” and everything is fine now. Maybe you haven’t tried that yet? I had that happen to my Bernina a few years ago and it turned out my timing was off a little. You might need to have it serviced to fix the timing. Never a fun thing! Good luck getting this baby finished. I had a similar problem with my Viking Rose. Then Barb Shie, quilt teacher extraordinaire, gifted us a sample of Superior Threads “Master Piece,” and all was well. Rose is one picky rhymes with witch, but as long as I use “Master Piece” thread, she is fine! Where did you find a repair man who comes to your house? Grant House saved me a couple of times. Good luck, that quilt is fantastic. That quilt is so pretty, so sorry you are having this problem. Had a problem with my Bernina once, stitches not good and it sounded like farm machinery. And I had just gotten it cleaned and serviced. Took it back to repairman, 30 miles away, they put a spool of their thread on the machine and it worked great. It was a bad spool of thread, a brand that I had used before with no problems. Hope you find your problem soon! so sorry to hear about all these troubles, it must be so frustrating. The quilt is looking stunning as usual, hope you can get back on track soon. Sending lots of good quilty thoughts. Good luck getting it sorted! It will all work out in the end. Sometimes machines get tempermental and decide not to work for a day or two, and then work fine without reason. It’s frustrating for sure. It’s a gorgeous quilt and this will add more character to its creation story. 🙂 Fingers crossed for you! Argh! Sewing can be like the most zen-inspiring yoga or the ugliest match in World Wide Wrestling. Chin up, this too will pass. I think this is an excellent reason to have a back up machine! Or even more than one which is kinda how I justify my collection. I hope your machine is running smoothly again as I write this comment! Oh no!! What did the great and powerful sewing machine fix it guy say? Did he fix it??? This is a beautiful quilt–I’ve been following your progress on this, because I am rather enamored of the design. Hang in there and get it done. you have a sewing machine fixing person that makes house calls?!?!? i’m glad to read in your latest post that it is fixed. but the house calls part still has me astounded.